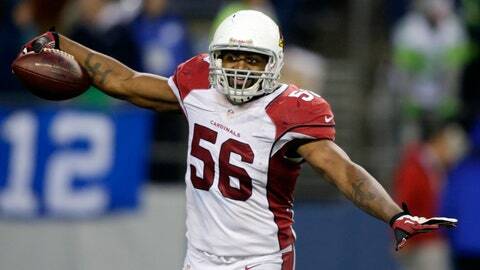 Karlos Dansby reacts after his interception in the final minutes of the Cardinals' 17-10 win over the Seahawks. Earlier in the season, we noted that with few exceptions, you need to do more than the expected to make the NFL playoffs. You need to win more than the games you’re supposed to win. The Cardinals hadn’t done that through 14 games, losing tough road games at San Francisco and Philadelphia. But they finally added that necessary bullet point in emphatic fashion on Sunday — against the unlikeliest of opponents. If you needed any further proof that these are not Ken Whisenhunt’s Cardinals, Sunday’s 17-10 win in Seattle should do. The last time the Cardinals played at Seattle, they lost 58-0. This time, they beat a team that likely will earn the No. 1 seed in the NFC playoffs, a team that hadn’t lost at home since 2011 (14 straight wins), a team that is the favorite to represent the NFC in the Super Bowl. "That’s a great football team that we just played. Whether we make the playoffs or not, we beat one of the best," Cardinals coach Bruce Arians said. "I think we’re a little more than competitive right now. We’re able to get to 3-3 in the division after going 0-3. We’re not the same football team we were earlier in the year — that’s evident. The belief in this locker room is strong." The sad part of this incredible run the Cards are on is that it still won’t likely be enough to earn a postseason shot. Just as the Seahawks were kicking off to the Cardinals at CenturyLink Field, Arizona’s playoff hopes suffered a major blow when Carolina quarterback Cam Newton connected with Domenik Hixon for a 14-yard touchdown pass to give the Panthers a 17-13 win over the Saints and a playoff berth. That means the Cardinals need San Francisco to lose its final two games — Monday night at home against Atlanta (4-10) and next week in Glendale — or New Orleans to lose at home to Tampa Bay (4-11) next week in order to earn a playoff spot. You’ve no doubt heard the NFL mantra "on any given Sunday," but given the stakes for both the 49ers and Saints and the quality of their opponents, it seems likely the Cardinals will become just the second 11-5 team to miss the playoffs under the 12-team playoff format (the 2008 Patriots were the other). That’s a shame, because the Cardinals are clearly playoff-worthy. They have won seven of their last eight games and proved Sunday that they can win in any setting, against the highest caliber of opponent. They can even win in tough settings when their quarterback throws four interceptions, as Carson Palmer did, bringing his season total to 21. And for that, they can thank their emerging defense, which dusted itself off after subpar showing in Tennessee and turned in perhaps its best game of the season. Of course, it did have that 58-0 loss last season as motivation. How confident was the Cardinals defense that it could get the job done on Sunday? They brought Skittles to eat on the sidelines after the game — perhaps a jab at Seahawks running back Marshawn Lynch, who was caught on camera eating Skittles on the sideline during the Seahawks’ Week 7 win over the Cardinals in Glendale. Nose tackle Dan Williams was caught on camera Sunday handing some to linebacker John Abraham, and that made sense. If any unit deserved to share the rainbow on Sunday, it was Arizona’s defense, which dominated the Seattle offense all day long. The Cardinals held the Seahawks to just 51 offensive plays for 192 yards, making a statement about which defense was the more elite group. Quarterback Russell Wilson, who hadn’t lost a game at home as a pro, completed just 11 of 27 passes for 108 yards, a TD and an interception for a passer rating of 49.6, his lowest this season. "That was really impressive, being able to sit back and watch what those guys were able to do," receiver Larry Fitzgerald said. "We put them in some tough situations, turned the ball over a few times, and those guys never waivered, they never flinched. They continued to play for each other, and I’m so happy to be on this team with those guys." The Cardinals will need an awful lot of luck to continue this improbable run beyond the regular season and next week’s home finale against the 49ers. But when Arians took over, he told team president Michael Bidwill that he wanted the last week of the regular season to matter. It will, and that is a credit to every level of this organization coming off last season’s 5-11 nightmare.